Reno–Tahoe International Airport or RNO is both public and military airport situated just 3 miles from downtown Reno, in Washoe County, Nevada, United States of America. Reno airport is the second busiest airport in the whole state. It serves more than 140 daily flights, 15 of which are non-stop. RNO handles roughly 85 thousand aircraft operations and 4 million passenger conveyance annually. Airport includes 1 main Terminal with two concourses (B and C), a total of 23 Gates and 3 runways. 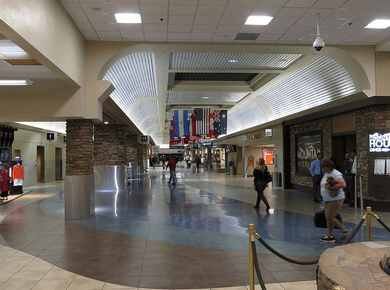 Reno airport terminal offers a great variety of restaurants, bars and cafes. The new Escape Lounge provides a host of amenities, such as gift shops, fresh magazines, high-speed Fi-Wi connection, charging stations and many others. RNO parking includes next options: Parking Structure garage, Long-term surface lot, motorcycle and bicycle parking spaces, separated employee and crew member parking lots plus Cell Phone lot. Parking Structure garage is a well-protected three-storey building, situated just across the main terminal. Ground floor includes Short-term parking rates. Reno airport Long-Term parking is provided by Parking structure 2nd and 3rd levels. You can find roughly 2 thousand parking spaces at the garage. The uncovered surface lot is just south of the Parking Structure; it provides 1.5 additional places. Both parking facilities are open 24/7. The Cell Phone lot is located just a few minutes away from the airport and offers free parking. This lot was specially designed for drivers who came to wait for the arrivals. Drivers cannot leave the car as no unattended vehicles are allowed as well as commercial vehicles. Reno airport parking rates $1 for the first 30 minutes and $2 for the first hour, plus $1 per each additional hour, up to daily maximum. Short-Term parking (1st level) costs $24 per day. Long-Term parking (2nd and 3rd Levels) costs $14 per day. Long-Term Parking (Surface Lot) costs $10 per day. Motorcycle and bicycle parking lots are absolutely free of charge. If you’re looking for a cheaper place to leave your car, take a look at these off-site airport proposals: SureStay Plus Hotel and Plaza Hotel by Best Western Reno Airport, Holiday Inn Express, Atlantis, Circus Circus, Eldorado and many others. Most of these hotels provide free shuttle bus service that will take you to the airport and back. And don’t forget to use Reno airport parking coupons to make your stay even cheaper!